Paris/New Delhi/Seattle: A wooden swing hangs from a motorcycle chain on a porch in western India where Vilas Khoyani rocks her seven-month-old son, born eight days after her husband committed suicide. How they ended up in this two-room house starts with an unsold bag of diamond jewellery in Phoenix. “They wouldn’t even let me open my bag," said Giladi, who was carrying bracelets, earrings, pendants and rings priced from $200 (Rs9,720) to $4,000, many made with tiny diamonds of the type polished in India. “Every store, they were watching CNN, and they’d say, ‘Oh my God, what’s going to happen next?’"
What Giladi saw in Phoenix that day, diamond polisher Mahesh Khoyani wouldn’t feel for two months: an economic tsunami set off by Lehman’s collapse that drove down Christmas sales by at least 20% at US jewellery counters, halved imports of uncut gems by traders in Antwerp, Belgium, who could no longer get credit, washed away the livelihoods of 400,000 diamond workers in India and shut mines in Botswana. The industry—which employs at least one million people from Jwaneng, Botswana, to Surat, India, to New York’s diamond district—faces two more years of turmoil, and prices may not return to pre-crisis levels for at least a decade, said Richard Platt, managing director of WWW Diamond Forecasts Ltd in Eastbourne, UK. Platt, who created pricing scenarios when he worked at Johannesburg-based De Beers Group, the world’s largest diamond supplier, said prices for rough stones, up 40% since March, are unjustified by retail sales and will probably fall over the next 12 months. Polished prices will stagnate after a 4% rise, he said. That means more hardship in the jewellery business in the US, where sales have fallen every month this year through June and aren’t expected to recover anytime soon; in Botswana, which is bracing for a 50% drop in diamond revenue in 2009; and in India, where 240,000 polishers and cutters may not be able to return to work for at least 18 months after the recession ends, according to Vasant Mehta, chairman of the Gem and Jewellery Export Promotion Council in Mumbai. “We relied on diamonds, and they betrayed us," Vilas Khoyani said, staring into space outside her parents’ home in Sanathali, 814km north of Mumbai, where she lives with her two sons, Diviesh and four-year-old Tushar. The aftermath of Lehman’s crash laid bare how the credit glut pumped up valuations of the billion-year-old sparkling gems. In the six months following the bank’s collapse, as credit markets froze, prices for rough stones fell 40% and those for polished gems slumped 19%, according to data from WWWDiamond Forecasts and PolishedPrices.com, which provides pricing information. Everyone along the supply chain had bought into the bubble, including Mahesh Khoyani, who dropped out of school after class V and was 29 when he died. He took out a loan last October, as disaster curled his way, to finance construction of a Rs4 lakh two-bedroom house for his growing family in his ancestral village near Rajkot, a city of one million in Gujarat. The value of polished stones shipped from India, where 11 of every 12 diamonds sold in the world are cut and polished, tumbled 59% in November from the month before, according to the gem council in Mumbai. By late December, the wave had rolled back to the source, in Botswana, where Goitseone Kgosi, 26, a contracted equipment repairman, lost his job at the Jwaneng diamond mine, the richest in the world. The pit, run jointly by De Beers and the government of the southern African nation, shut for four months. “They told us that Americans weren’t buying diamonds," Kgosi said in July, as chickens and dogs roamed around him on a dusty sidewalk in Jwaneng. “I had to move out of the room I rented. I didn’t have money for food." Diamonds, among the world’s hardest natural substances, proved unable to withstand the pressure from the worst recession since World War II. Global diamond jewellery sales are down as much as 10% this year, after expanding to around $73 billion in 2007 and running at a similar pace in 2008 before the slump began in October, according to Russell Shor, senior industry analyst at the California-based Gemological Institute of America. Decades-old US chains including Fortunoff Holdings Llc, founded in Brooklyn in 1922, and Whitehall Jewelers Holdings Inc. of Chicago, started in 1895, have sought bankruptcy protection. Texas-based Zale Corp., whose shares have dropped 73% since 16 September last year, said it shut 118 stores in the quarter ended in July, bringing the number of closures in the first seven months of this year to 191. Lehman’s downfall dealt the industry a double whammy: First, it sparked a run on the $3.6 trillion money market industry, which provides short-term loans called commercial paper used by businesses worldwide to cover everyday expenses. That led banks to stop extending credit in general, hurting jewellery stores and diamond wholesalers worldwide. The demise of what was once Wall Street’s fourth largest investment bank also wrecked the wealth of baby boomers who accounted for 40% of US jewellery sales, according to Nick White, a former chief operating officer at Zale. “They’ve lost a tonne of money in the market," said White, now an independent consultant and custom jeweller in Beaver Dam, Kentucky. They’re not going to be buying that really big stone for the 50th wedding anniversary. The ripples had scarcely been felt in Surat when many of the city’s 400,000 diamond polishers headed home for Diwali, the most important holiday for Hindus. Khoyani took a bus 420km north-west to the village of Jasdan to make a Rs1.5 lakh down payment on his house. “He was talking about saving more money, taking loans and paying for it before our second child was born," his widow said in a July interview. “We could never afford to buy a house in Surat." The city of 2.9 million people on the banks of the Tapti river has been a diamond transit point since the 1600s. During the past decade, the number of three- and four-storey workshops in Surat’s narrow lanes swelled, packing the streets with gem traders and porters bearing plastic cups of sugary tea while Bollywood music blared from the buildings. Surat was quieter when Khoyani returned in mid-November. He was told his factory would remain closed for several more weeks. He went to see Laxman Dhola, who operated a workshop with four scaifes, or rotating wheels that resemble record turntables and are used to polish diamonds. Dhola paid Rs20 for each rough diamond polished, said Praful Porsia, 21, who worked alongside Khoyani. Polishers would get around 10 stones a day to turn into tiny 0.05-carat gems for the types of bangles and necklaces sold by Giladi. Inside Dhola’s fourth-floor shop, Khoyani would squat beneath a fluorescent light on the dirt-encrusted floor. He would place a rough stone, mounted on a holder called a dop, on a scaife covered with oil and diamond dust. He didn’t talk much, Porsia said, other than to ask for more work. He would keep telling Dhola to give him more stones to polish, Porsia said. He needed the money to pay for his house. As exports of polished diamonds from India plunged, at least 160 members of the council for the gem and jewellery industry ascended a marble staircase to a banquet hall at the Karma Liquid Lounge restaurant in Mumbai on 14 November. They decided to appeal to all diamond traders to stop importing rough stones for a month, according to Sabyasachi Ray, the council’s executive director. The move was unprecedented, said Mehta, the group’s chairman. Imports of rough diamonds in December fell 91% from the same month the previous year, to $85.8 million, based on council data. There were days when Khoyani wouldn’t polish a single stone, Porsia said. He fell behind in his payments to the builder and to an uncle, who loaned him Rs50,000, said Dinesh Ruparalia, Vilas’s brother and a former diamond polisher. 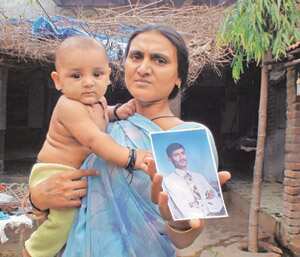 On the morning of 28 December, Khoyani left home in Surat to pick up a newspaper. Instead, he swallowed pesticide. He collapsed in his wife’s arms on his return, Vilas said. He was dead when they got to a hospital at 10am. “He was scared after hearing about the slowdown, but I had no inkling he had lost all hope," the widow said, speaking in Gujarati as her mother poured milky tea from a kettle into stainless-steel saucers. At least 16 diamond polishers killed themselves between 11 October and 20 March, said K.M. Patel, assistant labour commissioner in Surat, citing a report compiled by the local government. Some 413,780 of India’s 710,950 diamond workers lost their jobs, according to a 26 February report by the Reserve Bank of India. Almost half of those were in Surat. Dhola shut his factory in April, said Porsia, who now works in a shop on the first floor of the same building. Dhola couldn’t be located. Nasreen Seria in Johannesburg, Jerry Bungu in Gaborone, Marybeth Sandell in Stockholm, Dune Lawrence in New York, Thomas Mulier in Geneva and Paresh Jatakia in Mumbai contributed to this story.